Good Friday was quite possibly the coldest track meet I’ve ever attended. Usually the Good Friday meet in recent years has been about dodging the rain and getting through the program, but this year it was about staying warm and dodging the snow! Things got off to a bit of a slow start with the sprint qualifying as I did a rather pedestrian 12.265 for the 200m, good enough for just 12th, but with the top 24 going through I was safely into the sprint rounds. My time wasn’t helped by the fact I started my effort too soon, and into a block headwind, something you can’t practice day in day out on an indoor velodrome! Learning from my mistake in qualifying I used my opponents as a windbreak down the back straight and then tried to come round in the final bend and along the home straight. Unfortunately for me I was racing Lewis Olivia, and just as at nationals in October, he just had too much speed for me as I sat on his hip unable to make it past. Into the repecharge I went, however not before racing in the Rudd Handicap Race, a 500m sprint race. I was starting the furthest back from the 10m line in my heat, chasing the other 6 – 7 riders who were lined up in front of me at various markers depending on their ability and previous handicap race results. By the back straight I’d picked off a number of riders and was scything through the field, but as the finish line approached and the handicap unwound, I just finished outside the top 2 cut. Back to the sprint repecharge, this time it was a 4up race, 2 Italians and former Para-T teammate Jon-Allan Butterworth. Using my windbreak technique, I sat on the Italians wheel before kicking for home. This time I had enough speed and came past on the finishing straight to take my first win this year, and book a place into the quarter finals. In the quarter finals I was up against double World Champion Robert Forstemann from Germany, and Tom Baker. Knowing the calibre of Forstemann, I knew it was going to be a tough task to make it any further in the competition, and with a mistake in positioning down the back straight, any chance I had was gone. In the 5th-12th place final there was a lot of switching as everyone battled for position, in the end I finished 4th, which equated to 9th overall. Not a bad day at the office considering the strength of the field. 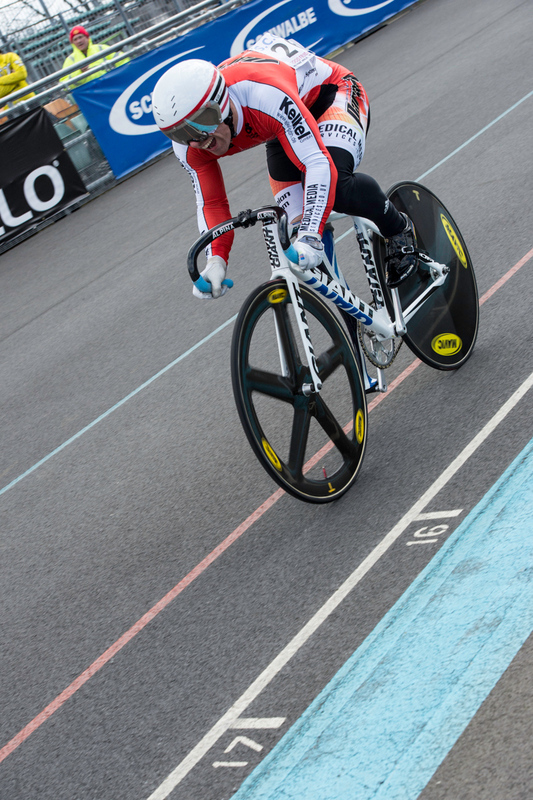 On to the Keirin, where I started hard and got onto the wheel to led out the race as the Derny Pacer bike came past. With the bike peeling off with 1 lap to go, it was going to be tough to take the win from the front due to the strong wind down the back straight. I tried not to panic as a few riders came over the top of me and quickly jumped into their slip stream to wind up my sprint, timing it perfectly in the home straight to take the win, and a place into the final. The final was a major squeeze on the start line, with 10riders shoulder to shoulder! The first corner was carnage as we all aimed for the back of the Derny. Unfortunately I wasn’t as ruthless as I should be and settled into the back of the line-up, so as the sprint started, I found myself in the wrong position with a lot of work just to make it near the front of the race. By the time I was on the home straight, there was just too much distance to make up to the calibre of sprinters in front of me. However I kept pushing to the line to pick up a 6th place. Thankfully Herne Hill stayed dry for the duration, although I hope it’s the last meet I have to warm up on the rollers in a big football managers jacket and woolly hat! Finally, a big thanks to the organisers and I look forward to racing again next year.